The origins of the School of English can be traced back to the Department of English and Secretarial Studies in the Birmingham College of Commerce in the 1950s (in a building on the present Aston University site). In 1959, the department began offering the external University of London BA English degree on a part-time basis, with a full-time version following in 1964. One of the graduates during this period was the celebrated novelist Jim Crace, who has since served as a Visiting Professor in the School. During the 1960s the department became the Department of English and Foreign Languages, in the Faculty of Arts and Social Sciences, and this became one of the constituent faculties when the City of Birmingham Polytechnic was formed in 1971. The department began offering its own Council for National Academic Awards (CNAA) English degree in 1973. Eventually the part-time evening mode of the University of London degree was phased out and replaced by a part-time version of the CNAA degree. During the 1980s the department lost foreign languages to the Business School and became the Department of English and Communication Studies within the Faculty of Health and Social Sciences. When the 'Commerce' building was sold to Aston University, the department moved to the Westbourne Road site now known as City South Campus alongside the Faculty of Education. Three years later it moved to the third floor of Baker Building on the Perry Barr site now known as City North Campus. In 1985 the English degree was revised and renamed BA English Language and Literature. At the time, this was one of the few single honours courses that allowed students to combine literary and linguistic study. In 1992 polytechnics were given university status and Birmingham Polytechnic became the University of Central England in Birmingham. English and Communication Studies went their separate ways: Communication Studies to Art and Design, and English (now the School of English) to the Faculty of Computing and Information Studies, which was eventually renamed the Faculty of Computing, Information and English (CIE). During the 1990s, the English degree took in around 100 students every year and went through a number of reviews and developments. A distance learning MA in English Linguistics (originally English Language) began in 1992, and an MA in Literary Studies was introduced in 1998. In 2004 the School joined the Faculty of Law and Social Sciences, which was initially renamed Law, Humanities and Social Sciences (LHSS), and then a year later Law, Humanities, Development and Society (LHDS) when it moved into Dawson Building. 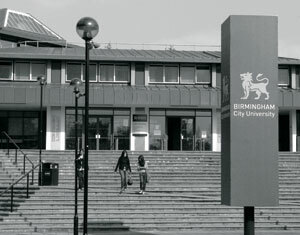 With the faculty reorganisation in the renamed Birmingham City University in 2007, the School of English found itself in the Faculty of Performance, Media and English (PME) and back in Baker Building. Since Summer 2015 the School of English has been based in the Curzon Building in Birmingham City Centre, joining the other constituent departments in the Faculty of Arts, Design and Media. The School still offers an integrated BA English Language and Literature degree, but it has added popular routeways in Creative Writing and Drama. There is now a postgraduate course in Creative Writing, which sees the School's work showcased in venues such as Foyle's Bookshop, The Royal Court Theatre and the Birmingham Conservatoire. Our research has grown exponentially in recent years. The School has made a strong return to every Research Assessment Exercise (RAE and REF) since 1996 and currently boasts scholars and writers of international renown in all its constituent fields, whether literature, linguistics, drama or creative writing. There have been major funded research projects from the Arts and Heritage Resource Council (AHRC), Engineering and Physical Sciences Research Council (EPSRC) and Leverhulme Trust, and the work of members of the School features regularly in world-leading journals and publishing houses. In 2012 we launched our Institute of Creative and Critical Writing. After many years of forging strong links with local creative organisations, the Institute provides the perfect base upon which to expand this activity. It brings together writers, academics and students to share ideas and experience. Our alumni have found great jobs: as journalists, lawyers, teachers, business analysts, marketers, lecturers, even comedians (perhaps our most famous ex-student is Frank Skinner). We are proud of them all; proud of our past; proud of our present and expect to go developing long into the future.